Corneal refractive surgeons are likely already familiar with the theory behind small incision lenticule extraction (SMILE) and the excellent postoperative outcomes it can achieve, but they were left without a thorough and comprehensive guide to performing the procedure, until now. 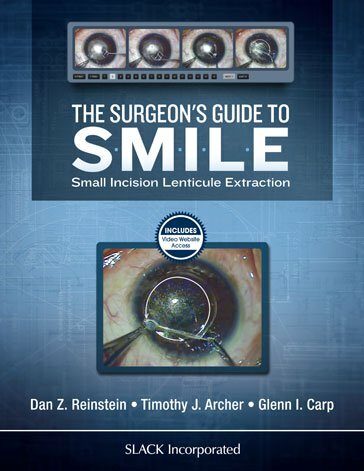 The Surgeon’s Guide to SMILE: Small Incision Lenticule Extraction is designed to provide surgeons who are interested in starting or are already performing SMILE with a detailed description of the preoperative assessment, surgical technique, and postoperative management of SMILE treatments. This book by Professor Dan Z. Reinstein, Mr. Timothy J. Archer, and Dr. Glenn I. Carp is designed as a surgical video-fellowship, focusing on the granular details of every aspect of patient preparation and management with special attention to how to perform a perfect routine SMILE procedure. The protocols and methods are sourced in both the published scientific evidence and the extensive experience and expertise of the authors. It also includes tips and tricks of how to manage the full range of possible scenarios and complications that can occur during and after a SMILE surgery. Each process described in the book is accompanied by at least one, and in many cases numerous, narrated video examples. This dynamic learning tool is supplemented by the SMILE video library containing over 16 hours of surgical videos and tutorials. The succinct and demonstrative style of The Surgeon’s Guide to SMILE: Small Incision Lenticule Extraction will help novice and experienced SMILE surgeons alike learn important techniques and improve their outcomes. Dan Z. Reinstein, MD, MA(Cantab), FRCSC, DABO, FRCOphth, FEBO is the Medical Director of London Vision Clinic, London, UK, Adjunct Professor of Ophthalmology at Columbia University Medical Center, New York, Visiting Professor at Ulster University, Coleraine, UK, and Professeur Associe en Ophtalmologie at the Centre Hospitalier National d’Ophthalmologie des Quinzes Vingts, Paris, France. Professor Reinstein received his undergraduate degree from Cambridge University, Cambridge, UK, and his postgraduate degree in medicine from the University of Cambridge School of Clinical Medicine. He conducted his internship in medicine at the University College London School of Medicine, University of London, UK. He spent several years at the Weill Medical College of Cornell University in New York as a Bioengineering Fellow, developing very high-frequency (VHF) digital ultrasound technology (Artemis Insight 100) for studying the micro-anatomical structure of the cornea in vivo. His residency in ophthalmology was at the Icahn School of Medicine at Mount Sinai, New York, and his Fellowship training in refractive surgery, cornea, and external diseases of the eye was completed at the University of British Columbia, Vancouver, British Columbia, Canada. He is US board-certified and a Diplomat of the American Board of Ophthalmology, Fellow of the Royal College of Physicians and Surgeons (Canada), Fellow of the Royal College of Ophthalmologists (UK), and Fellow of the European Board of Ophthalmology. Professor Reinstein’s research focuses on applications of VHF digital ultrasound technology to improve corneal and phakic intraocular refractive surgery with a particular focus on measurement and analysis of corneal epithelial changes for applications such as keratoconus screening and therapeutic corneal refractive surgery. He has held the position of lead consultant to Carl Zeiss Meditec for 17 years, developing their presbyopic excimer laser application (PRESBYOND Laser Blended Vision) and has contributed to the development of SMILE: a flapless keyhole intrastromal method of performing keratomileusis. His research has led to more than 145 peer-reviewed publications, 35 book chapters and 550 international presentations and lectures. He was awarded the Waring Medal in 2006 and received the Kritzinger Award in 2013. He holds more than 10 patents in the field of corneal laser refractive surgery, ultrasound diagnostic imaging and signal processing. In 2015, Professor Reinstein was appointed Visiting Professor at Ulster University, in order to join the faculty of the Post-Graduate Diploma in Cataract and Refractive Surgery—one of the few formal training courses in refractive surgery. Together with his colleagues at the London Vision Clinic, he provided a total 34 lectures to update the corneal laser refractive surgery half of the course. Concurrently with his medical career Professor Reinstein has been playing the saxophone for over 40 years including 2 years as performance scholar at the Berklee College of Music, Boston, Massachusetts, and he continues to play jazz on a regular basis. Glenn I. Carp, MBBCh, FC Ophth (SA) is a distinguished and skilled ophthalmic surgeon, who has undergone one of the most extensive training programs of any laser eye surgeon in the UK. He is one of the very few full-time consultant Ophthalmic Surgeons in the UK to dedicate his entire professional career to corneal laser refractive surgery. Born and educated in South Africa, he qualified as a doctor in 1996 in Johannesburg. He began his career in ophthalmology as an Ophthalmic Senior House Officer, followed by a year spent as a Clinical Research Officer, and followed this with his residency training in the Department of Ophthalmology at the University of the Witwatersrand in South Africa. On completion of his training he was awarded the Elie Dahan Opthalmic Surgery Prize for outstanding performance. On emigrating to the UK, Mr. Carp was selected for a prestigious 1-year fellowship in Cornea and Anterior Segment Pathology and Surgery at the Western Eye Hospital, London. He subsequently undertook an 18-month fellowship in Laser Refractive Surgery at the London Vision Clinic under Professor Dan Reinstein and has now, in turn, supervised the training of 6 fellows at the London Vision Clinic. Mr. Carp is a regular attendee both at national and international congresses around the world, delivering more than 200 lectures at professional meetings on 5 continents. In addition, he has published more than 25 articles in peer-reviewed medical journals and in the Ophthalmic press. He is also a Carl Zeiss Meditec-appointed expert and speaker both for congress symposia and training courses. Mr. Carp’s teaching experience also extends to being a supervisor and contributor to a number of lectures on the Ulster University Post-Graduate Diploma in Cataract and Refractive Surgery. He has himself achieved a distinction for this Diploma and was awarded the Certificate in Laser Refractive Surgery from the Royal College of Ophthalmologists in the UK in 2009. Mr. Carp had his own laser eye surgery with Professor Reinstein in 2006, and recently returned the favor in April 2016. Timothy J. Archer, MA(Oxon), DipCompSci(Cantab) has been the research manager at the London Vision Clinic since 2003. He arrived at the clinic having studied mathematics at Oxford University followed by computer science at Cambridge University. His numerical background has enabled him to form an efficient partnership with Professor Reinstein and Mr. Carp by combining analytical skills and mindset with their surgical and clinical knowledge. Over the last 14 years, Mr. Archer has built up the London Vision Clinic research output to produce more than 1 peer-reviewed publication each month, as well as overseeing the preparation of more than 100 presentations at international conferences and training courses each year. He was instrumental in preparing the lecture materials for the Ulster University Post-Graduate Diploma Cataract and Refractive Surgery and is currently completing a PhD under the supervision of Professor Tara Moore at Ulster University. He is responsible for running the biannual training courses in PRESBYOND Laser Blended Vision and SMILE, also participating as a lecturer in treatment planning and nomogram development. Mr. Archer has also applied his computer science background to build and implement various software solutions to maximize the efficiency of data analysis at London Vision Clinic. These have included building the PIQASO II database to automate the analysis of refractive surgery outcomes, as well as managing the project to transition from paper charts to electronic medical records. His expertise in refractive surgery outcomes analysis has led to his contributions to the series of editorials in the Journal of Refractive Surgery expanding and updating the Standard Graphs for Reporting Refractive Surgery. As part of this process, he built a publicly available template spreadsheet for plotting these graphs according to the published format.